This week’s article is not so much a teaching as it is a reflection and a call to a point of consideration. It springs from Bible study which I presented this Sunday on the Apostles. Before I get to the heart of the matter, I need to present some background material. Prior to roughly 1055AD, there was really one Church. Church historians sometimes refer to this as the era of the “Great Church.” The Protestant Reformation would not occur for another five centuries or so, thus there were no “Protestants” per se. Since “Roman-Catholic” is a designation that is typically presented in contrast to Protestant, it is inappropriate to talk about Roman-Catholicism at that time as well. There were neither Protestants nor Catholics; there were just Christians. Now, admittedly, there had been some heretical groups that, though rejecting the decisions of the rest of Christianity, still continued to call themselves Christians. There were also so regional differences which were growing more profound. Those regional differences became quite marked between the eastern and western parts of the Roman Empire which came to be known as Eastern and Western Christianity. In the East, all of the liturgies were celebrated in Greek; in the West, all of their liturgies were celebrated in Latin. In the East, clergy were allowed to marry, while the West had begun to enforce clerical celibacy. The West had added a word (yes, one word) to the ancient Nicene Creed. This outraged the East, which rightfully claimed that a statement made with the authority of an Ecumenical Council of the Church could not be amended by the decision of anything less than another Ecumenical Council. The unfortunate heart of their ultimate division had to do, I am afraid, with each side trying to claim jurisdiction over disputed “border” churches in areas that could have been considered either Eastern or Western. Each side tried to tell the other what they could and could not do. Neither reacted well to this infringement upon their rightful sovereignty. In the end, the East excommunicated the West and the West excommunicated the East. Essentially, each side officially declared that anyone who followed the other side was damned to Hell. The mutual excommunications have since been lifted, but only recently, and some old prejudices still remain. It was only after the Great East-West Schism that it became appropriate to talk of Eastern and Western Christianity, which have since become known as the Eastern Orthodox and the Roman-Catholics. Going further back into history for a different element of the needed background, after the martyrdom of St. James, the brother of John, Christianity began to spread outside of Jerusalem. Eventually the remaining Apostles left Jerusalem and began evangelizing the rest of the Roman Empire and beyond. In many cases, the Apostles established churches in the towns to which they travelled and many became known as the first bishop of the city. 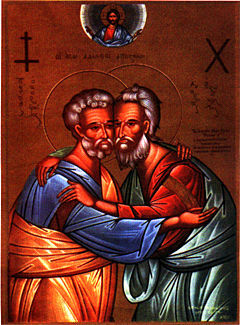 For example, St. Mark is credited with having established the church in Alexandria, Egypt, and is considered their first bishop. St. Titus is considered the first bishop of the island of Crete and St. Silas is considered to be the first bishop in the church of Corinth. This is not to say that they were the first Christians in these cities, but they are regarded as having formalized or established the first congregations. Think of it along the lines as having been a home group fellowship as opposed to a group of people who have called their first pastor. The head of Western Christianity, prior to the Protestant Reformation, was unquestionably Rome. The head of Eastern Christianity was the major metropolis of Byzantium, which the Emperor Constantine renamed Constantinople. 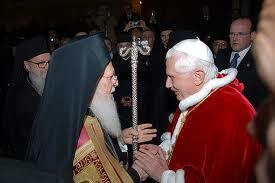 The Pope, who counts among his titles “the Patriarch of the West” resides in Rome. The Ecumenical Patriarch, the leader of the Eastern Orthodox churches, resides in what was once Constantinople and is now called Istanbul. 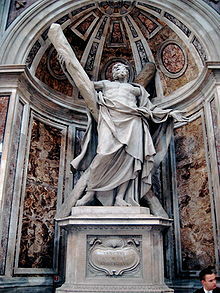 Now, to the heart of the matter, Rome has always claimed, and none have ever substantially refuted the idea, that St. Peter was the first bishop of Rome. The Eastern Orthodox churches have always claimed, and, likewise, none have really refuted, that the first bishop of Constantinople was none of that St. Andrew, the brother of St. Peter. Thus, for hundreds of years, the greatest antagonistic force within Christianity has come from the spiritual descendants of two brothers. Could the rivalry and disputes between Eastern and Western Christianity have a spiritual seed in the animosity of brotherly rivalry? To be sure, there are significant and substantial differences between East and West in both theology and in practice, but could they not have been handled with less stubbornness and pride (on both sides), as they have been in more recent years? If one looks at the behavior of the Papacy and the Patriarchate over the last near millennia, does their behavior not mirror that of brotherly rivalry? The refusal to communicate, the digging in of heals, the ignoring of the other, the name-calling, it all smacks of sibling rivalry! I have no earth-shattering conclusions in regards to this observation. I have no recommendation for how to remedy this ancient rivalry and animosity. As an only child, I have only my observations about my own sons to clue me in on how brothers behave, and they, are only one and three years old. I see with them that, when one has a contrite heart, a few minutes will usually bring the other around. It is much more fun to play together than apart. Perhaps a thousand years is enough time to stay mad. Perhaps the Patriarch of the West and the Ecumenical Patriarch will soon come to realize how much more thrilling all of life can be when brothers work together in concord.